The 100mm Box Gutter range is similar in profile to the PVC Square Gutter range, but with all the benefits of a cast iron system. The profile is not actually square but slightly wider than it is deep, and comes in a pre-painted black or grey primer finish. 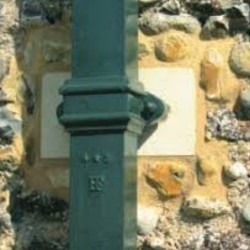 Box gutters are ubiquitous in their PVC format, but not so often seen in Cast Iron. Popular on barns, schools, churches and other public buildings, box gutters in Cast Iron can also be used for domestic housing projects to add a touch of interest and differentiation to a refurbishment or new build scheme. 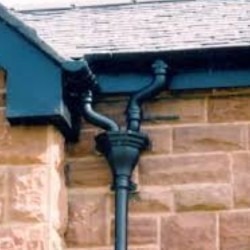 The downpipes used for this system are circular and come in two different size options, 65mm or 75mm. 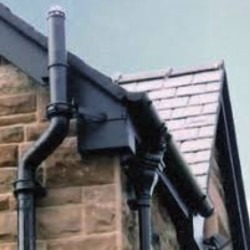 As with all of our Cast Iron gutter and drainage systems, our Box Gutters are supplied by Yorkshire-based Hargreaves Foundries, who have been casting iron products in the UK since the 19th century.